Bet365 will give you half your stake back for every Each-Way single bet you place on the Grand National, up to a maximum of £125 per customer. Looking for Grand National Betting tips? We got you covered! 3. Bet365 will give you half the stake back for every Each-Way single bet you place on the race, up to a maximum total refund of £125* per customer. 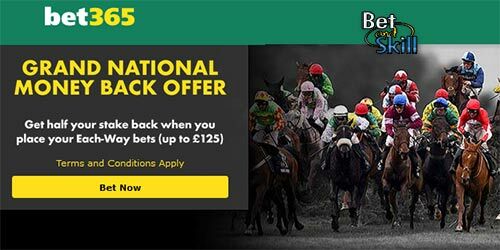 The Grand National Money Back Offer is only available to eligible bet365 customers who opened their account before 23:59:59 UK Time on Wednesday 3rd April 2019. Get half your stake back when you place your Each Way bets (up to £125*). This applies to bets placed on the Win and Each Way Fixed Odds, Enhanced Place Terms and Each Way Extra markets between 00:00:01 UK Time on Thursday 4th April 2019 and 11:59:59 UK Time on Saturday 6th April 2019 only. Bets placed outside of these times will not qualify. This offer can be claimed on multiple selections on the Grand National for bets placed Each Way up to a maximum total refund of £125*. Bet restrictions and T&Cs apply. Eligible customers only. This offer applies to Each-Way single bets placed on the Win and Each-Way Fixed Odds (5 Place) market and Enhanced Place Terms (6 Place) market for the Grand National, taking place at Aintree on Saturday 6th April 2019. This offer is only available between 00:00:01 UK Time on Wednesday 3rd April 2019 and 11:59:59 UK Time on Saturday 6th April 2019. Bets placed outside these times will not qualify. This offer is only available to existing bet365 customers who opened their account before 23:59:59 UK Time on Wednesday 3rd April 2019. Refunds will be equal to half the total stake of all qualifying bets placed on the Grand National, taking place at Aintree on Saturday 6th April 2019, up to a maximum of £125* per customer. We will aim to credit your refund within two hours of bet placement. Tote bets do not count as qualifying bets and will not be refunded. This offer will not apply where all or part of a bet has been Cashed Out or edited using our Edit Bet feature. Once a refund has been credited, the Cash Out and Edit Bet features are not available for qualifying bets. 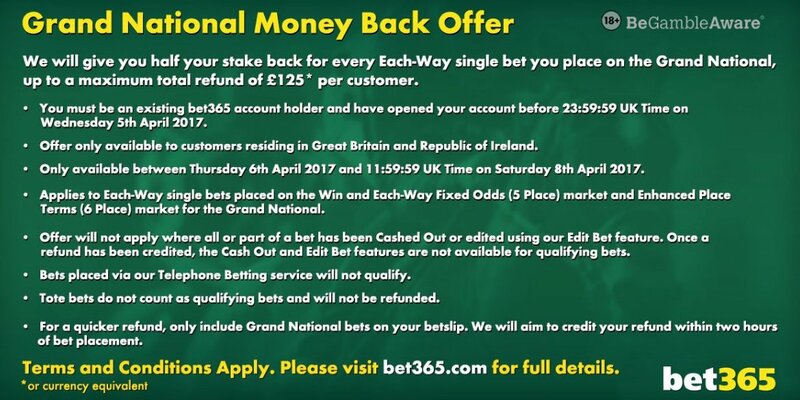 "Bet365 Grand National 50% Money Back Offer on Each-Way Bets (up to £125)"